I’m designing a poster. It’s not much like the striking USSR-style propaganda made by my enemies in ADVENT, but I’m hoping it’ll do the same for our side. Instead of Russian constructivism, I’m harnessing the power of Michael Jackson. 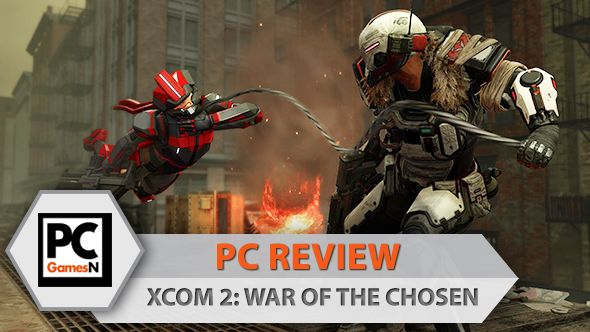 Even before War of the Chosen came along, XCOM 2 made our list of the best strategy games on PC. This specific work of art is made to commemorate the new battle bond between two XCOM rookies, Shin & McIntyre. They have the ring of an ‘80s pop duo about them – Simon & Garfunkel, Hall & Oates – so I’ve plumped for a background of exposed brickwork, in the style of Jackson’s Off the Wall. The pair stand back to back, just as they did in their first fight: a mission to recover an ADVENT power converter from the back of a truck. “I certainly hope our propaganda effort is not funded from my research budget,” research head Dr. Tygan grumbles. “I think we need more dead aliens to get the effect we’re going for,” a more constructive Chief Engineer Shen suggests. 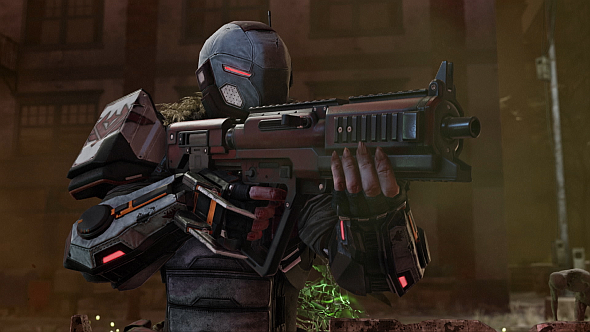 Poster-making isn’t the most significant feature to come to XCOM 2 in War of the Chosen. But it is representative of a philosophical shift in the far-reaching new expansion. Where the vanilla XCOM 2 pushed its commanders towards cold, calculating utilitarianism, this version of the game is about the individual. It starts with Shin & McIntyre, and the new bonds system. Like most of XCOM’s squad progression, bonds work in the background to begin with, granting every possible pair of soldiers in your barracks a random compatibility rating that determines whether they’ll be able to buddy up in the future. It sounds a bit like dating app maths, but feels authentic: Shin & McIntyre just click, knowing they’re destined to sing falsetto together, while other soldiers are unlikely to ever foster more than a respectful tolerance for each other. That is, unless they suffer through something that binds them despite their differences. A few missions after forging that first bond, during a botched attempt to destroy an ADVENT research post, I order a grenadier to throw an unconscious squaddie over his shoulder and airlift them to safety. In the moment it’s merely a practical decision made in a desperate situation, but War of the Chosen recognises this as a cracking piece of emergent storytelling. Though that injured soldier has yet to leave the infirmary, they now share a new level of compatibility with the heavy who saved their life. It’s not all surface – these are friends with gameplay benefits. McIntyre has been known to pull an extra action out of Shin simply by egging him on. And later, bonded soldiers gain extra wellbeing simply by standing on adjacent tiles, justifying the emotional instinct to keep the two close. These quiet marriages of theme and mechanics can be powerful. If you send one soldier over to slap some sense into their partner in a moment of panic, that’s a little story to remember long after the map’s objectives are met. While Firaxis are wise to double down on their capacity for systemic storytelling, I’m a little less sold on War of the Chosen’s expanded cast of scripted characters. Joining the beloved Bradford, Shen, and Tygan are three rebel faction commanders, plus another three bigshot aliens – the Chosen of the title. It’s an approach that lumbers the very early part of the game with an excess of dialogue that doesn’t play to the studio’s strengths. The introduction of the Chosen in particular feels one dimensional – three snarling characters defined by their chosen weapon, a barely repressed desire to murder each other, and not much else. Thankfully, these thinly drawn characters are the faces of some elaborate new ideas that weave directly into XCOM 2’s existing campaign. The Chosen, as you’ve probably heard by now, are Shadow of Mordor-inspired recurring bosses with unique powers and weaknesses that develop over the course of a campaign. I can confirm they have a habit of kidnapping your best soldiers and gloating over comms on the world map (seriously, who gave them the ship’s number?). The rebel factions, meanwhile, change the game much more quickly. The idea is that each have independently learned how to live rough in an ADVENT-ruled world, and developed specialised skillsets as a result. Curry enough favour with the state-harried Reapers and you can recruit a crack sniper with unrivaled concealment abilities, for instance. Befriend the Skirmishers, former ADVENT soldiers who’ve abandoned their posts, and you’ll feel the benefit of one of their highly-mobile shock troopers. 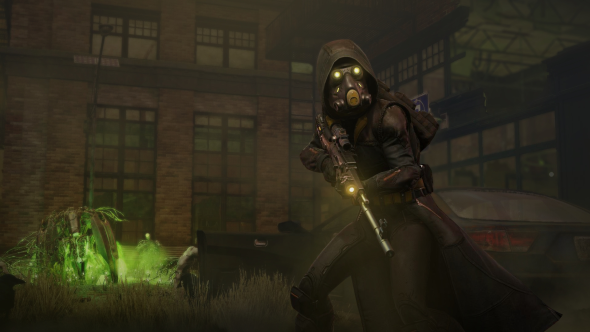 You can exploit these new connections to plough further down your favoured play styles than ever before in XCOM. But far more interesting, I think, is the possibility of playing with a top-drawer fighter in a class you’ve mostly missed out on. One unfortunate side effect of XCOM 2’s natural-selection-by-permadeath is that it tends to close off the classes you’re weaker with. I’ve never been much good at keeping Rangers alive long enough to bring their swords to bear, and always wind up with at least a couple of marksmen in my final squad. With the help of the Skirmishers, though, I can shotgun with the best – grappling my way around the battlefield with hero unit Mox in a way I haven’t enjoyed since Just Cause. In short, the factions enable a tactical flexibility that’s new and immediately different to the base game. That newfound strategic variety is compounded by a new breed of enemies: the Lost. These ashen creatures are what remains of the human populace in urban centres devastated during the invasion. 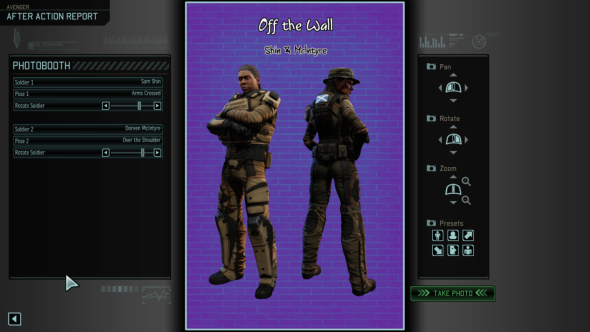 They’re a pain in ADVENT’s arse as well as ours: zombie-like in behaviour, they act as the catalysts for turning some of XCOM’s most fundamental rules upside-down. The Lost don’t shoot salvos of plasma fire – instead closing to melee distance in numbers previously reserved only for XCOM 2’s higher difficulty settings. Firaxis balance the threat with a free-shot rule: every time you down one of the crumbly buggers, you get another go, potentially chaining a series of kills in a single soldier’s turn. The consequences, in Lost-focused battles, are significant: there’s no sense in clinging to cover when it affords no bonus against melee. Instead you learn to position your troops out in the open, with line-of-sight to as many mutants as possible. It makes sense to cluster your soldiers together, ready to cover for each other when a shot doesn’t quite come off. Ammo conservation and reloading suddenly become the most important issues on your plate. It’s gratifying to see Firaxis flip the familiar givens of their game, seemingly just to find out how far it can be pushed. 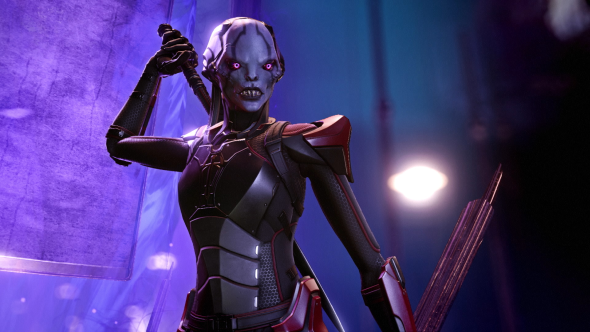 From a technical perspective, there’s still a vague sense that XCOM 2 struggles under its own weight. Playing on a GTX 1060, there have been moments between turns when War of the Chosen slows uncomfortably, long seconds passing as the game presumably wrestles with unseen calculations. On the plus side, this expansion sees the sequel’s more ambitious art style come into its own. In the cities of the Lost, you’ll find statuesque bodies frozen at the point of death, arms raised in vain like the citizens of Herculaneum. 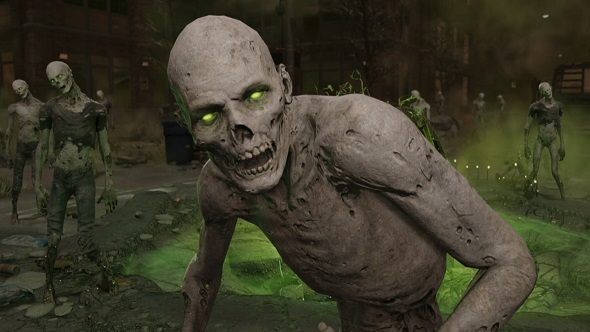 Firaxis dress these ghoulish mannequins in green fairy lights for maximum eeriness – and, in an inspired touch, cause them to collapse into dust as your squaddies brush past. We’ve come a long way from the sometimes incohesive look of Enemy Unknown. Back to Shin & McIntyre, however: I can’t tell you how their story ends, but I cantell you that their relationship is under new strain. Lately, Shin has been suffering from phobophobia – a fear of panic with the whiff of Darkest Dungeon about it. Lead designer Jake Solomon would say it has something to do with the fact that I’ve repeatedly sent him onto the battlefield while fatigued. I’d suggest it has everything to do with the fact that McIntyre took a potshot at him in a state of sectoid-induced temporary madness. But hey, we’re still printing those posters. I see them sometimes, pasted to the side of ruined buildings outside ADVENT’s urban jurisdiction. Two heroes who, any day now, might become martyrs. In its new expansion, XCOM 2 makes people of its soldiers and turns its aliens into personalities. It cares about the individual. But that’s only so you feel the loss of your bonds more keenly, and hate the enemy more personally. In War of the Chosen, Firaxis are being kind to be cruel.